What type of player does a collegiate coach look for when recruiting? While there is no single answer to the question, ESPN RISE spoke with lacrosse head coaches at Denver, Jacksonville, Johns Hopkins and Notre Dame to find out some ways a player can gain a college coach’s attention. ESPN RISE: What can a player do to get noticed? “There are three different avenues a guy can take. If I were trying to be noticed I would pick my events in the summer and fall. I would do some self-promotion to the programs I was interested in and I would use my high school coach to help get my name out there. Lacrosse is growing rapidly in high school, according to a US Lacrosse report the sport has grown from more than 250,000 participants in 2001 to more than 560,000 in 2009. In contrast, according to LaxPower.com, NCAA Division I lacrosse has gone from 50 teams in 1981 to 60 in 2010. The number of participants has grown from 1,600 to 2,500. With more high school athletes vying for a Division I scholarship, the process has grown more competitive. To help make sense of the process, ESPN RISE spoke with coaches at several colleges and asked them to break down the process, from getting noticed to the realities of getting a Division I scholarship. Every Tuesday over the next few months, ESPN RISE editors will release a new story in the weekly series Recruiting Road. We will feature coaches’ and recruiters’ answers to some of the most asked recruiting questions. ESPN RISE: How does the scholarship process for Division I lacrosse break down? With Division I programs allotted 12.6 scholarships for their entire team, college coaches rarely give out full scholarships, instead opting to parse out those scholarships in varying increments. The college coaches ESPN RISE spoke with said the biggest misconception in lacrosse recruiting is the thinking that those 12.6 scholarships are available each year. Programs are alloted that number to use for their entire roster, which has typically 45 to 50 players. So if a player graduates who was given $200, for example, the program can now use that $200 on another player. Club lacrosse could help you get noticed. As club lacrosse expands, more college coaches are taking notice. Last week, ESPN RISE asked coaches what athletes should consider when picking events. Sticking with the event theme and looking at the expanding landscape of club lacrosse tournaments along with individual showcase camps, we wanted to find out what role does club lacrosse and the individual camps play in the recruiting process. Club lacrosse has been expanding the last few years and in many ways models soccer. Regional players gather to form clubs and travel to showcase tournaments. These tournaments are a great way for college coaches to take notice of talent. Many coaches realize the growing importance of club lacrosse, but acknowledge that the high school coach is still their point of contact with potential recruits in many instances. ESPN RISE: What role does club lacrosse and individual lacrosse camps play in the recruiting process? What to do – and what not to do – on college recruiting visits. High school athletes should look at the entire picture, from academics to non-athlete facilities, when looking at a school. If you’re considering whether to go on a college visit, paid or unofficial, put aside any reservations. You’re always better off going. Students who make visits before applying tend to enroll more often than those who apply without visiting, so schools keep track of who comes. If college officials think you might not be serious about going there, your admission letter might just wind up with somebody else. Plus, the only way to find out whether a school is a good fit for you is to see it for yourself. But don’t go without a plan. Coaches will show you around the athletic facilities, but don’t forget to pop into the admissions office and ask to take a campus tour, too. Remember, most of your time at school will be spent outside the lines.“Make sure you see everything you are capable of seeing,” says Oklahoma softball player Keilani Ricketts. Look at dorm rooms, cafeterias and libraries. Don’t base your decision just on the sport and its facilities. Think about whether you like the campus. “When you go on a visit,” says Notre Dame wide receiver Barry Gallup, “you want to take your sport out of it and say, ‘Could I see myself here if I wasn’t playing?’"
Meet with coaches and admissions officers, talk to students walking through the quad, pull a professor aside. Ask everyone anything and everything. Don’t worry about being a pest: Asking questions shows that you’re serious about learning more about the school. Schools want you to apply. It boosts their admissions statistics and increases their selectivity rating. So when you’re on a visit — especially an official one—remember that most people you talk to are selling something: their college. She’s right. At this point, all you’ve got is your reputation and if you mess up, the coach is sure to hear about it. “The most important thing,” Bowdoin athletic director Jeff Ward says, “is that you pick a school you’re comfortable at whether you play or not.” Holmes agrees. “You’re at school for nine months of the year. If you aren’t comfortable, those nine months seem like a lifetime.” So explore the campus, talk to everyone, ask your questions. Walk away knowing you learned everything you could about a school. And don’t commit unless you think it’s a good fit. Getting to play in premier events can be a challenge for some high school lacrosse players. Standing out among the hundreds of players is an even larger challenge. That’s one reason why over the past few years highlight DVDs and YouTube highlights have grown in popularity. It hasn’t reached the critical mass that it has in football, but more high school lacrosse players are using the highlight reel to gain college coaches’ attention. But what should you know before you send the DVD or YouTube clip? ESPN RISE spoke with five college coaches to find out. ESPN RISE: What role does the highlight tape play in recruiting? Athletes should be proactive if they want to gain lacrosse college coaches’ attention. Baltimore, Long Island and Philadelphia are considered traditional hotbed areas for high school lacrosse, but one look at a college lacrosse roster and it’s obvious that players are coming from other areas of the country, now more than ever. But as lacrosse becomes more prevalent in areas like California, Florida, Georgia and South Carolina, players in those areas will continue to improve. ESPN RISE spoke with five Division I head coaches and asked them for recruiting advice for players from non-traditional areas. There are many options outside of Division I for high school lacrosse athletes. Self awareness can be tough. For a high school athlete, it can mean the difference between realizing their talent does not match up with the dream of playing Division I lacrosse. But self awareness can be an athlete’s biggest asset. Knowing your skills and knowing how you match up against players on your team, league and state can go a long way in helping an athlete find a college that is best suited to their talents and future goals. But figuring out what level of lacrosse suits you best can be challenging, which is why ESPN RISE asked five college coaches how players can help themselves determine how good they really are. ESPN RISE: How do you determine what level of lacrosse you are best suited to play? “The first resource should always be the high school coach. Sometimes the kids don’t like what they hear, but I don’t know of a high school coach in the country that wants to put a young man in a tough situation and oversell him. As a high school coach, they get a feel for the kids. Maybe they have a teammate whose father played collegiate lacrosse, so that could be a resource they can reach out and talk to. If they call us as coaches and we’re recruiting them we will certainly give them an indicator, at least for our program. But remember, just because I’m not recruiting you, it doesn’t mean you’re not a Division I player. Recruiting is in the eye of the beholder.” Talent gets you noticed, grades get you an offer. 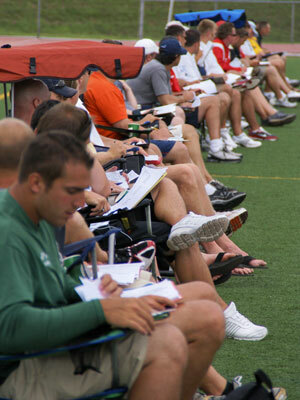 Coaches look for A’s and B’s and high PSAT scores from potential lacrosse recruits. Getting noticed, putting together a good highlight tape and playing in important events will only take a high school lacrosse player so far. If the athlete does not have the grades to get into a school, it won’t matter how talented they are on the field. As recruiting has accelerated, with players committing before their junior seasons, coaches have started looking at grades during freshman year and PSAT’s to get an idea if that player will qualify. ESPN RISE spoke with two Division I coaches about what coaches look for academically.